I had so much fun picking this block for our Guilds Paint Chip Challenge. Picking, yes. Constructing, yes. Assembling, NO! But...I got it done, I got it done, I got it done! Frustration from beginning to end, yet I love this block! A quick recap: Those are the two paint chips I had to work with. We were allowed to use one other color and a neutral if we wanted. My initial plan was to add an accent color, in this case pink/magenta. While pre-planning my pieces to paper piece I had to change plans on so many colors it wasn't funny! During the entire process I was left wondering how this block would turn out in the end. You can check out Storm Before The Calm...Storm At Sea, for my first go around with this idea. 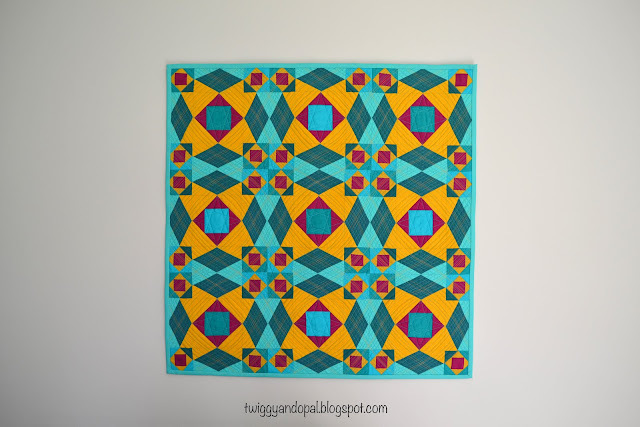 Because I was punting on colors based on what I had on hand, I had to mix and match the centers of the large square in a square blocks. Not a problem. Except I forgot about that detail after I finished piecing the blocks and when I was piecing the rows together! The actual piecing of the blocks was a breeze! I couldn't have been happier! When I saw what I had done I wanted to cry, instead I swore a blue streak! I wanted to say 'screw it' and let it live, but I couldn't! For anyone who paper pieces you know what a pain it is to rip out those teeny tiny stitches! But I did. I might have swore even more! Once I got back on track, after taking a lot of deep breaths and a few glasses of wine, I was ready to pick thread for quilting. And then there is the quilting plan...that hadn't quite made an appearance in my mind! These are my three thread choices: #2135 yellow, #4129 turf green and #1148 light jade. All are 50 wt, and in the end I went with just the yellow and light jade. I eventually decided I was going to follow the flow of the 'sea'! I wanted the motion and movement to show. I first stitched in the ditch and then very unscientifically stitched lines. All, mind you, very free and organic. I put the pedal to the metal and went for it! I especially love the yellow accent thread. It stands out in just the right way and just the right amount. For the center squares, I did a simple geometric star. The star was completely different from the rest of the quilting, simple. I really like how this quilt turned out. 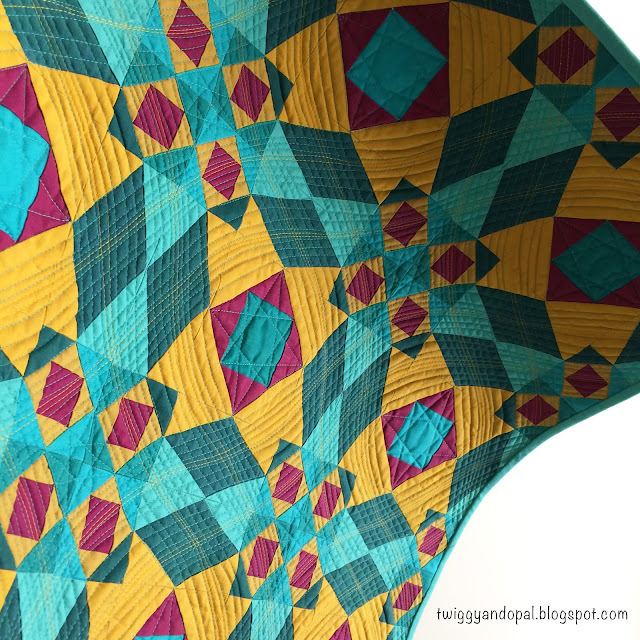 From piecing, to color, to quilting! Even with all the pitfalls, missteps and difficulties, I thoroughly enjoyed making this block. We may complain (and boy do I) about certain parts of any block, but we love it! I could see making another version of this block. 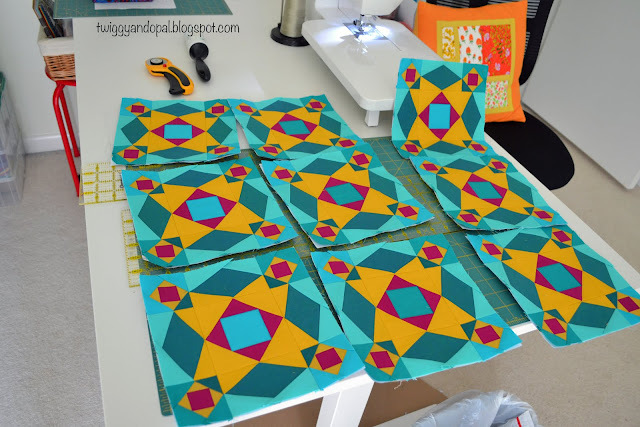 Different colors, different guidelines and larger blocks! What is the one block that tests your limits, but you can't help but love it?! I love this! So bold and striking! 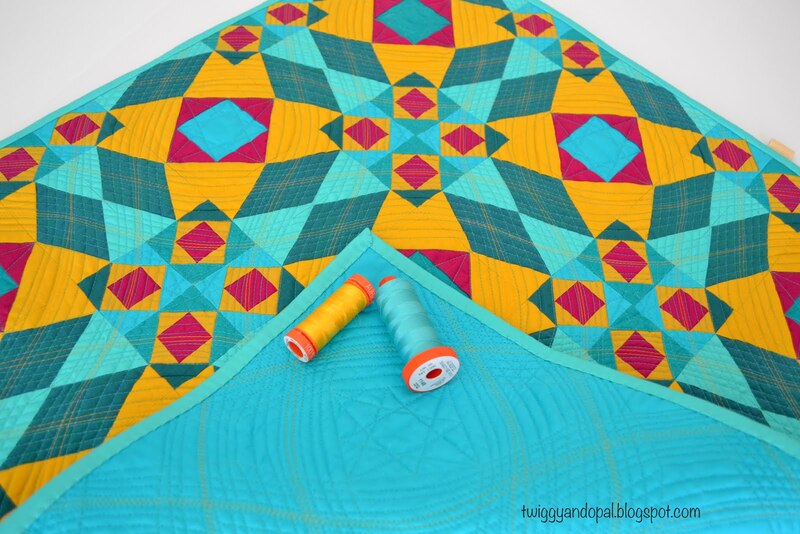 Gorgeous quilt and the quilting is perfect. 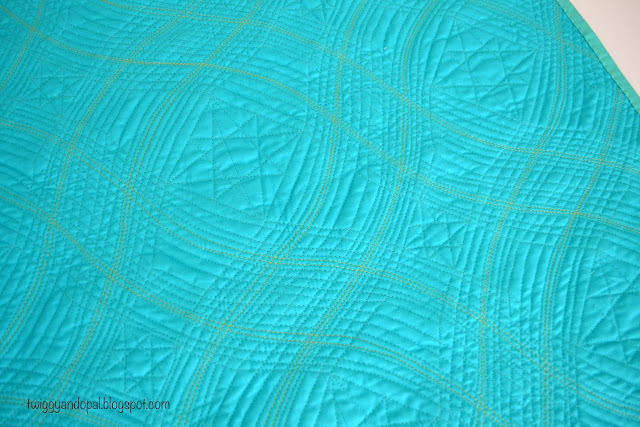 I had fun quilting the lines…nothing like putting the pedal to the metal!! 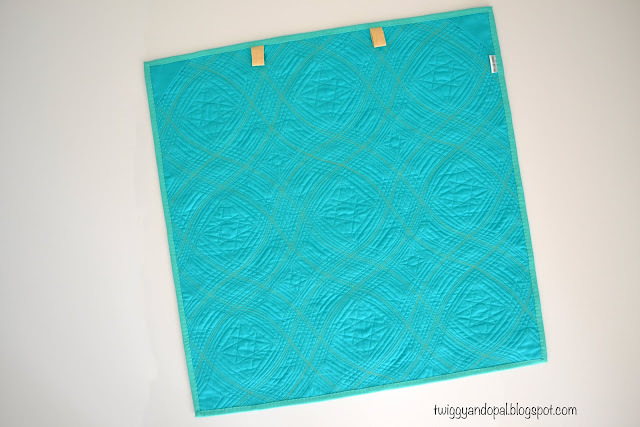 Beautiful quilt and your quilting choice is perfect! This is really an awesome quilt! I have picked out paper piecing before and do not like it! I think people either love or hate paper piecing! I never would have thought I would enjoy it as much as I do! Oh I've always wanted to make a storm at sea. Wonderful colours. What patience, but well rewarded. oh my gosh this is a stunner! Your quilting just put it over the top! This block had it’s moments, but mostly with the row construction…and it was ‘user error’! 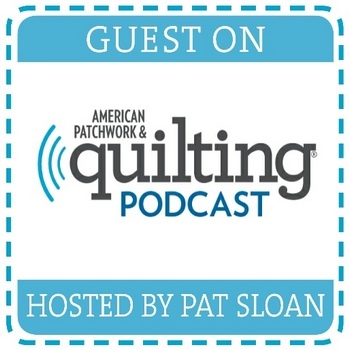 I had a blast with the quilting. Who wouldn’t when you can go like a mad women doing it?! 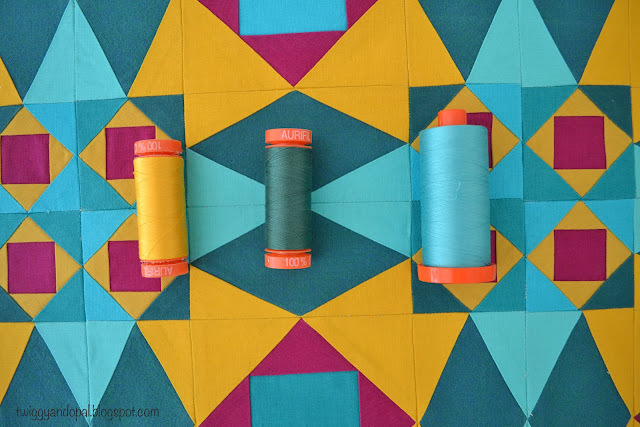 Wonderful color scheme, piecing and quilting! A magnificent quilt! I've always loved Storm At Sea. It's a gorgeous quilt and I love that it looks like it's curved. Your blocks are beautiful. I do NOT like or get any pleasure out of paper piecing. So sorry. Love the look and perfection but ... I do love applique and all the rest. I have a stack of finished hexies to do something with. That's all the paper piecing I plan on doing. Beautiful job, you, and congrats on the quilting. I love it!! You are more disciplined than I am! If I had to unpick all those stitches, the project would be residing at the bottom of my closet, under my scrap bin. : ) But your efforts were well worth it. This is one beautiful finish! I love this! 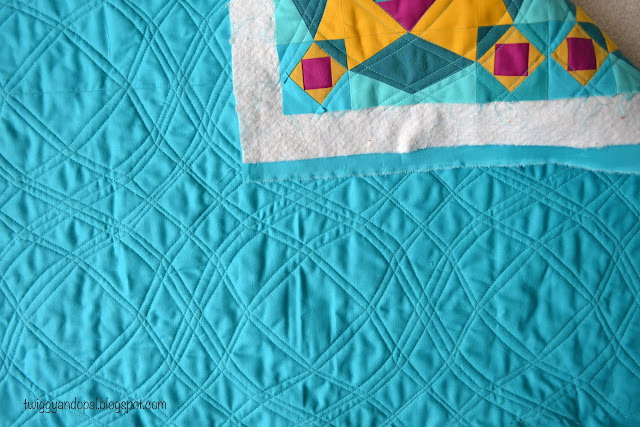 The blocks have such great flow and your colors and the quilting are perfect! 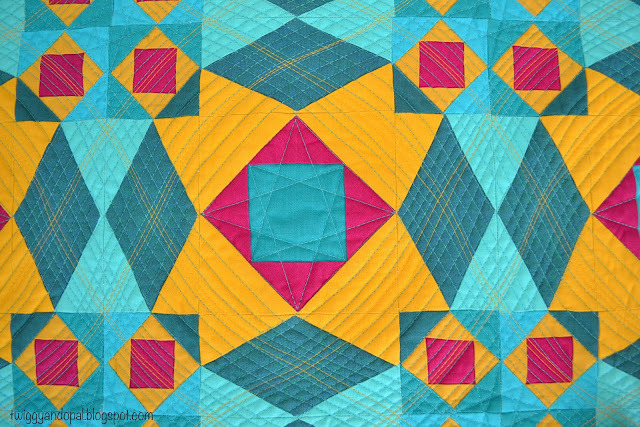 I agree that the yellow thread does a beautiful job of accenting the motion and adding a great depth to the quilt. Oh man, ripping paper piecing stitches is not fun, but the final results were well worth it! When do you share with your guild? Love this! Perfect colors and perfect quilting choice. This piece has such wonderful movement. I'm glad you bared this storm and showed the quilt who was boss! What a magnificent quilt. Thanks for sharing! It's gorgeous Jayne! Interesting block and striking colours. I love this one, Jayne! That yellow thread in the quilting gives the whole quilt that extra little zing and the quilting itself is perfect for this block. What a beautiful pattern! 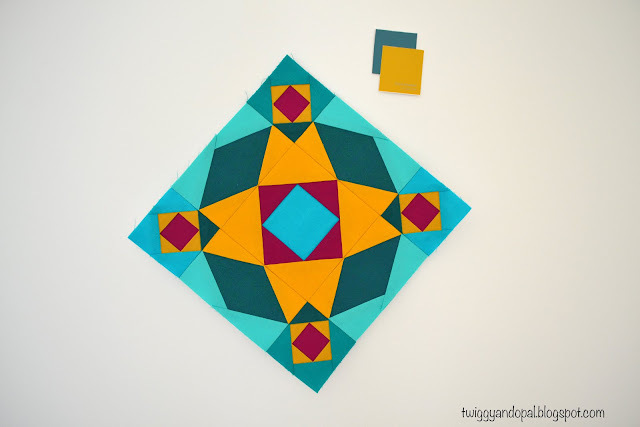 I made my first paper piecing block last week! Ready to start more! This is spectacular! I've never seen a Storm at Sea in such a bright, bold color scheme before, but I love it. I've got that pattern on my Do List as well, just have a few bazillion other things to finish up before I get to it! Wow! Lots of drama in that piece. Love your colors and the quilting is gorgeous. Congrats on a wonderful finish. Wow, I can't believe this quilt is only 24" square, it appears larger than it actually is. I don't know if I would have had the patience to have made this quilt but you definitely accomplished something major with me. I know there's been quilts which tested me and were worth the effort. Congratulations for finishing a beautiful quilt--the quilting is spectacular! I really like how it turned out, too! Everything about it is just perfect. It's hard to believe it's only 24"square. Great job!